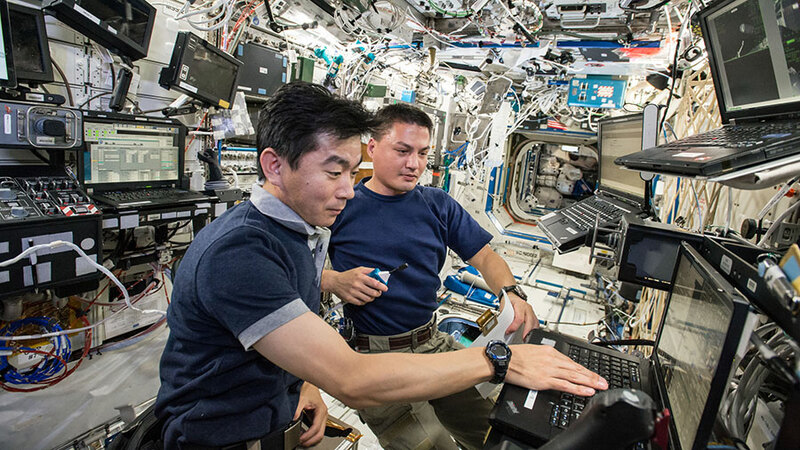 Astronauts Kimiya Yui and Kjell Lindgren train for the robotic capture of Japan’s “Kounotori” HTV-5 cargo craft. Japan’s fifth “Kounotori” cargo craft (HTV-5) is on orbit today chasing the International Space Station before Monday’s rendezvous and capture. The Expedition 44 crew is working normal science and maintenance activities today after a momentary power loss to some station systems Wednesday afternoon. The HTV-5 is delivering science gear to support several experiments including the CALET dark matter study and a series of 10 investigations for the Twins Study. The HTV-5 will be grappled with the Canadarm2 and berthed to the Harmony module for a month of cargo activities. The cosmonauts Gennady Padalka, Mikhail Kornienko and Oleg Kononenko worked Thursday on their set of Russian maintenance and microgravity research. They explored the physics of magnetism, internet control of a robotic arm and the human digestive system. The astronauts on the U.S. side of the space station, Scott Kelly, Kjell Lindgren and Kimiya Yui, had their list of daily upkeep and science tasks. More Ocular Health exams were on the schedule today as well as magnetic resonance imaging of the brain for the NeuroMapping study. The orbiting residents also worked on the maintenance of laboratory gear. I have just watched you ,ISS now. I have highest feeling!